A postpartum sitz bath is a special bath used in the early postpartum period to help ease the pain, promote healing, and give good hygiene to the perineal area. This is particularly helpful after an episiotomy or tearing during birth. Though it can also help ease swelling in the perineum or a swollen labia when there is no cut or tearing. In the hospital, you may be given a portable sitz bath. This sits over a normal sized toilet. You fill a bag with warm or cold water and sit on the sitz bath. The water then flows over your perineum allowing for healing and cleansing. You can add medication or herbal preparations at will. While you can use warm or cold water, the studies that have been done show that cold water provides more pain relief in the hour and half hour after doing the postpartum sitz bath. That said, women tended to prefer the use of warm water. You can imagine that cold water is quite the shock and not what we think of when it comes to comfort, but if you look at how we treat other injuries to our bodies, cold packs are quite normal in that context. Feel free to try both and decide which you prefer. Cold water also helped to reduce the swelling more effectively than warm water. The postpartum sitz bath can be done often throughout the day and is a lot easier than getting into the bathtub. Should you not have a portable sitz bath sent home with you, you can generally sit in the tub filled 2-3 inches with warm water for the same effect. Or you can order a portable sitz bath for your home, like the Yungatart Sitz Bath shown. There has been a very small study showing that using a common sitz bath at a hospital potentially spread some infections. This is a very old study, but it may influence how your local hospitals provide care. 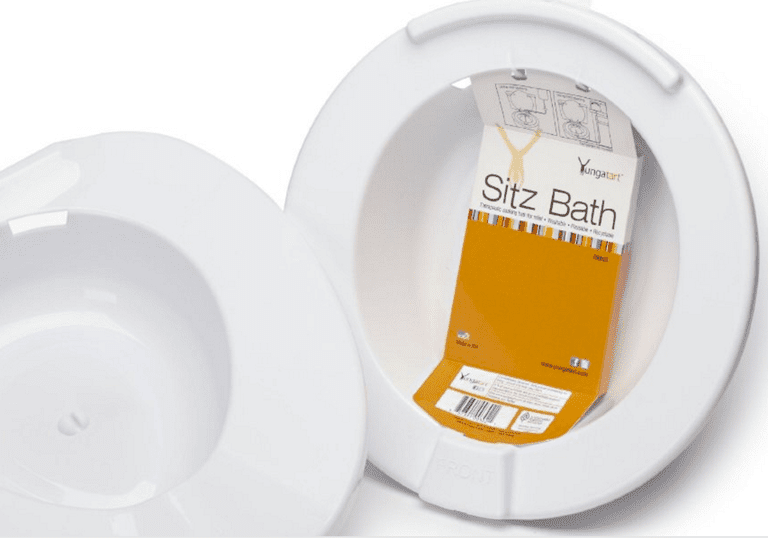 If you are concerned, you can ask about using a portable sitz bath. Droegemuller W. Cold Sitz Baths for Relief of Postpartum Perineal Pain. Clin Obstet Gynecol. 1980 Dec;23(4):1039-43. LaFoy J, Geden EA. Postepisiotomy Pain: Warm Versus Cold Sitz Bath. J Obstet Gynecol Neonatal Nurs.1989 Sep-Oct;18(5):399-403. Petersen MR. Review of Interventions to Relieve Postpartum Pain from Perineal Trauma. Am J Matern Child Nurs. 2011 Jul-Aug;36(4):241-5. doi: 10.1097/NMC.0b013e3182182579..
Ramler D, Roberts J. A Comparison of Cold and Warm Sitz Baths for Relief of postpartum Perineal Pain. J Obstet Gynecol Neonatal Nurs. 1986 Nov-Dec;15(6):471-4. Wiesenthal AM. A Maternal-Neonatal Outbreak of Infections Due to an Unusual Group A Beta-Hemolytic Streptococcus. Infect Control. 1984 Jun;5(6):271-4.